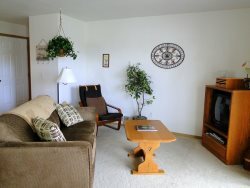 This home is a great choice for family reunions it is right in downtown Ocean Shores next to the Comfort Inn. There is a BBQ and everything else is there for your convenience. This home is ocean front although there is not a view from the house because it is a one story home and the dunes and trees block your view. The walk to the beach is about 300 yards through the dunes. All homes do require the first night plus tax for deposit. This deposit is non-refundable. If you cancel, this deposit IS NOT returned. There is a 2 night minimum stay, 3 nights during the holidays. All homes have a cleaning fee. There is no limit on cars for this home. You must be at least 25 yrs. old to rent one of our properties. We had a fantastic time staying at the Beach Breeze house, and I will most definitely be using your rental service again in the future. Your staff made our check in and check out process super easy and simple. Thank you! The Beach Breeze house was lovely. Everything was clean and well maintained inside. Fresh bed linens and plenty of towels in the bathrooms. Clean dish sponge, soap and all the essentials. The kitchen didnt have everything we needed, but it was stocked well enough that we could make it work. The hot tub was great, fire pit and front yard was perfect. I found the staff to be helpful, responsive and very friendly. All of my questions were answered promptly. The hot tub was a smashing success. Everyone who used it loved having it available. The bedrooms were roomy and spacious. We all had no problems with finding a space to spread out and relax. This property was perfect for our large group and kids! The boys loved the trail to the beach and being able to warm up in the hot tub. I was able to find everything I needed in the kitchen and everything seemed very clean. They were on point anything we needed they didn't hesitate to give us actually we were treated like royality. Great location close to the beach had a family reunion there couldn't have gotton a better spot everyone loved it. We'll be back next year. The team was very helpful with our reservation, checking us in and letting us know that if we needed anything or have any problems, let them know. We were very satisfied with their service. We stayed for four days, and there were sixteen of my family on this trip. Our stayed was a great experience even for our big group. The property suited our needs and expectations, and more. We would definitely stay the there again. This was our fourth year renting one of the properties. The staff has always been nice and easy to work with. Danielle was unbelievably kind, patient and helpful. I had SO many questions come up periodically prior to our arrival and she was gracious to answer every single one of them quickly and kindly. Upon check out, one of the guests realized she had left behind her personal Kindle. It took a couple of days to get maintenance or cleaning in to check for it but once it was found, Danielle was wonderfully expedient to get the situation remedied quickly. And she did not express any frustration to me regarding the situation. I know that many times when renting properties, the rental company takes no responsibility for items left behind. I was impressed at how this was handled. Extremely helpful, prompt and courteous! Overall, a great stay, just a couple of glitches that we lived with! We will be happy to come stay again! I think you made some changes to the outside. The painting and the remodeling looks great. It was great, we had everything we needed and property was well maintained.